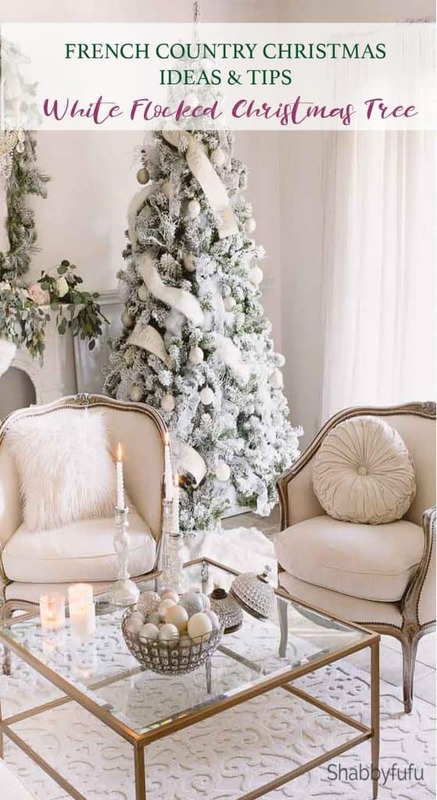 French country Christmas celebration in the living room with a white flocked tree and how to design a similar look. In our home we embrace a decidedly French country look, and I lean towards white often in my palette. White is such a peaceful and calming color and it allows the freedom to change the accessories often and with each season. Today I’ve partnered with King Of Christmas and some blog friends, and we each have our own take on decorating for Christmas. Lots of inspiration here for you…so scroll down and keep reading for all the looks! Find my trees here…. King Of Christmas! If you are coming here from my friend Jennifer of Town and Country Living, welcome! I love collaborating with with other creatives and do that often, and if you read THIS POST you’ll see how I first was introduced to King Of Christmas a few years back. I have several other Christmas trees but this year I wanted to do something that I have never done until now. Two trees in one room! I know…I often preach “less is more” and I do abide by that as my mantra these days. 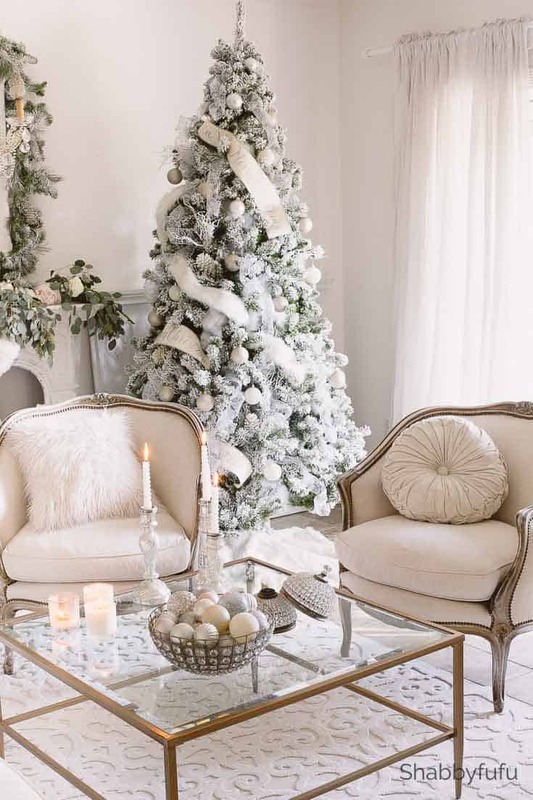 But the room is white and with the French country Christmas look I think that it works and adds a nice layer. If you decide to purchase a flocked Christmas tree this year, the PRINCE FLOCK CHRISTMAS TREE is what I am sharing today. We have 9′ ceiling height in oue home, and I selected two of the 8′ trees with lights. I know that King Of Christmas sells out quickly, so I would suggest getting your order in soon. Flocked trees are my very favorites and I’ve had others and even done some flocking myself. I’m happy to report that these trees do not scatter the flocking everywhere and whatever method they use to stick it works! 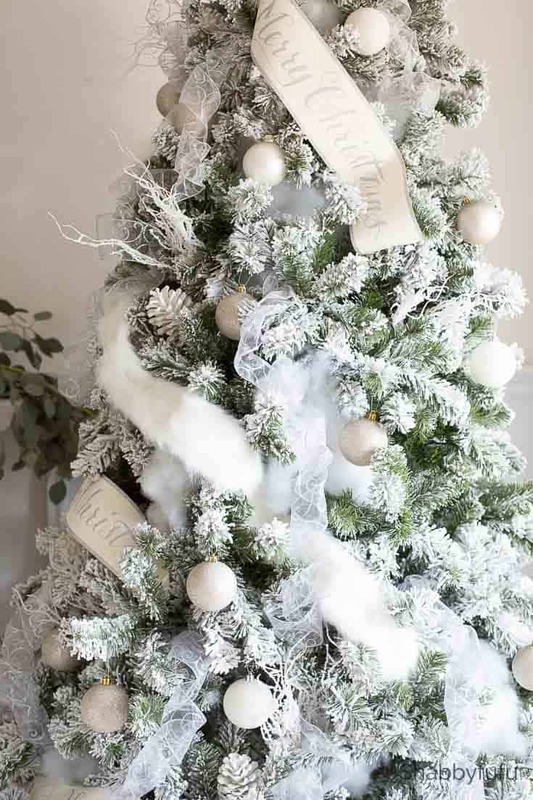 One thing that you should know about flocked trees, is that they should be stored out of the heat and the preferred method would be in a tree bag. Since we have no basement or attic, we store our trees in the garage. I ordered these STANDING CHRISTMAS TREE BAGS that will work with our limited storage. But…on to the decorating and a few tips! Set up your tree and fluff the branches. Turn on the lights, not only to make sure that they work, but it’s easier to see any “holes” that perhaps need more fluffing. This is my favorite tip…by FAR! See it in THIS POST from the past. 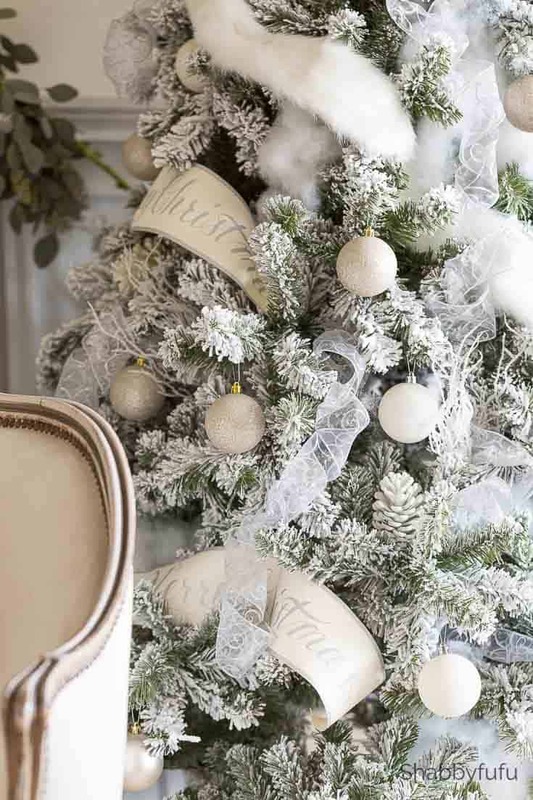 I wanted a white snowy look for this year’s French country Christmas look, so I opened my storage totes and grabbed white, silver, glittered and champagne ornaments. Hang your ornaments sparingly for a similar look and…no, I did not decorate the backs of the trees since they are close to the wall. Also tucked in a few white pinecones that I painted using THIS TECHNIQUE. Then I add some garland and in this case it was the Merry Christmas banners and the faux fur garland. I ordered these – faux fur tree skirts in the 56″ size. I love them because they snap closed instead of messy ties! The final touch was ribbon and I think that every tree decorator has their own idea of how to do this. I use wired ribbon and curl it around a few fingers. Then I lightly pull it down and let it fall free, similar to curling your hair with a curling iron! One end gets tucked in the branches and then step back for a look. The mantel came next and I wrapped some faux snowy garland over the top of the large mirror. On top of the mantel I laid out some simple fresh eucalyptus and tucked in a few fresh blush peonies. That will change, since the flowers won’t last…but I thought that this look was fun. With an all white decor, it’s key to use a variety of texture. 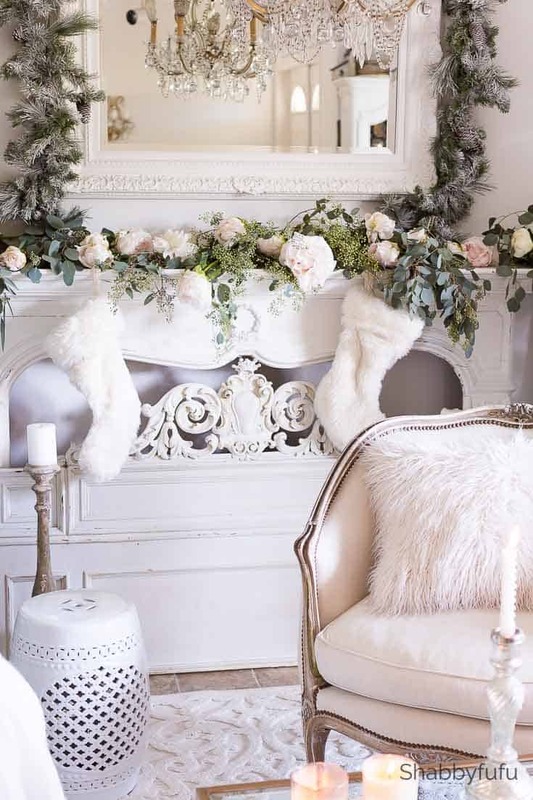 For the French country Christmas look I added some fun faux fur pillows to the old French chairs, a white garden seat and a new SCULPTED RUG that is actually washable! With 3 dogs I’m always looking for things that stand the test of time and so far, so good with this gorgeous rug. 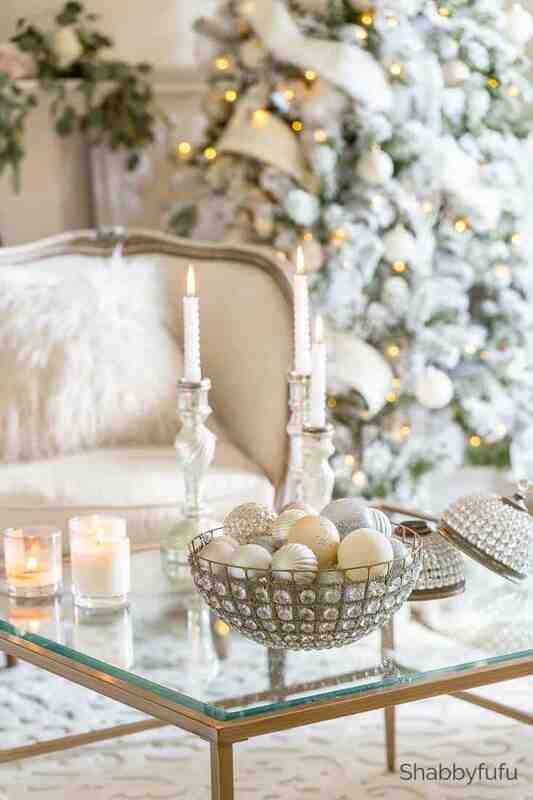 Last but not least, the BRASS AND GLASS COFFEE TABLE gets some love with candles and baubles. Texture and glam and can you guess what those beaded things are? Hint…they are vintage! 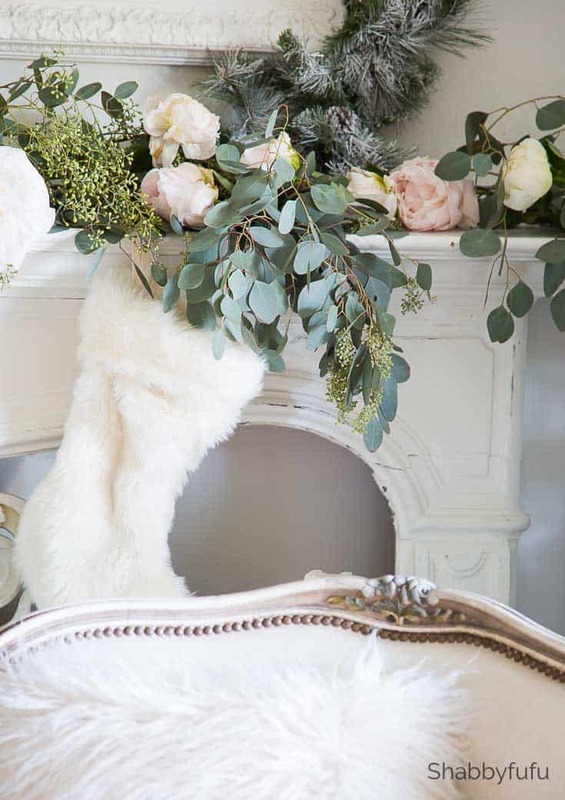 I hope that you’ve enjoyed my French country Christmas and next in today’s line up is my talented friend Cindy of Edith & Evelyn Vintage who also has a French country aesthetic! PIN THIS POST NOW TO REFER TO LATER! Good morning Christy! I have been updating the links to shop in the post, so you’ll see it there. I like the larger sized skirt and used the 56″ wide. These are great because they have snaps! Janet, this tree is truly magnificent!….I can just imagine the “wows” you will receive when friends and family see this spectacular tree…. Awww, thank you my friend! Hope you have a wonderful holiday season in your temporary home! So beautiful, Janet! I love all the ribbons on your tree. Thanks so much for inviting me to participate! Thanks for joining in Jennifer and enjoy your new King Of Christmas tree! Oh wow, this is amazing. Love your beautiful tree and your room is so stunning. Good morning Marty…thank you so much and I always look forward to this season, as I know you do too! Great blog! Lots of helpful information and beautiful eye candy! Your tree and mantel are stunning!! I just read all your tips, some I do and some I’ve never done but will be now. Particularly the one to use polyfill shaped snowballs. Brilliant idea!! I usually use giant balls but this is much better. Now you’ve got me in the mood and I’m going back to read all your past Christmas blogs! Gorgeous tree and absolutely gorgeous room! Love the rug and chairs too! Thanks so much Candy…lots more holiday inspiration coming your way! Hi Janet! Love how you decorated the tree and the whole design of the room. It looks like an elegant winter wonderland!! Thanks for the tip of curling the ribbon! I have done wired ribbon, but it always looked off and I couldn’t decide what I liked or disliked about it. I’m going to try that this year. Love it all! You always amaze me your styling. So elegant and the neutral is beautiful and unique. Love the flowy ribbon that adds movement and a romantic vibe. Lovely, Janet and thanks so much for including me in this blog tour! Thanks for joining in Janine…love your work! Janet, your tree is absolutely gorgeous and elegant. It fits your space perfectly! Thank you Villy…appreciate you popping over to the blog! Your tree is gorgeous! I would not want to leave your living room. It looks snowy and elegant. It’s such a romantic room! Now, what are those beautiful, shimmery things sitting on your coffee table? Are they antique cloches? Are they lids? Thank you so much Joanna! Those are flush mount antique lighting fixtures and I am simply using them as decorative objects! Hi Ruth…those are antique chairs and honestly I haven’t seen any reproductions that have the same detail. If I ever do I’ll let everyone know because I’m asked a lot! Everything is so pretty. I simply adore those mercury glass candle holders on your glass table. Are you able to provide the source? I’ve had those for years and can’t recall the source unfortunately.